Not to mention there's Shirley Mac Lain. Mysterious stranger (Glen Ford) arrives on the train. From the moment he hits town he establishes an identity of someone unpredictable and not to be messed with. He stumbles upon the leader of town characters, a livery stable owner, who he tricks and bribes into being his confidant. He aquires a following of curious onlookers. He asks the town characters who the biggest bully in town is. He is Jumbo, he finds Jumbo at the bar and picks a fight and beats him. All this is in preparation for the fact that he is a sheepman and he is going to bring a herd of sheep to the public cattle range. The entire opening sequence feels like it has been quoted by a number of films. The arrival on the train and the bet with himself sequence and the beating up of the baddest guy in town Corbucci quoted in Companero's. The crowd of onlookers reminds you of the town following Eastwood around in High Plains Drifter. All is now clear. 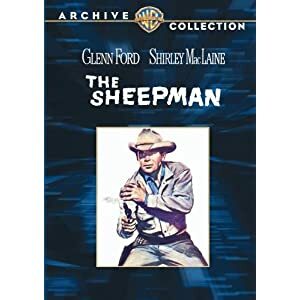 The burromen of the Sierra Madre earn titoli's disdain, but a sheepman is someone for him to praise. We all have our predilections, I guess. Of course: that all hangs on how big is one's subtext. I was looking for the thread via the index glad you found it, I'll fix the index. I completely agree with titoli's original post. All I really have to add is that this was a very smart revenge plot. It's mostly a comedy, but somehow feels like there is something serious underpinning it all along, not as much of a straight comedy like eg. McLintock or The Cheyenne Social Club. You are given a clue that this is somehow gonna be a serious revenge movie, when Ford tells MaClaine of his wife being killed by this gunman he is looking for. Then, toward the end, from the moment the Nielsen brings the three hired guns to town, the comedy is all gone, it becomes a very serious movie, there is no comedy whatsoever underpinning the gunfights at the end, which feel as serious as in any Western; but then it reverts to comedy again for the final scene. During those early scenes where Edgar Buchanan and his buddies are following Ford around everywhere, I was laughing so hard I couldn't breathe! And how about the chop suey restaurant in the Wild West; seeing the gundlinger digging his fork into some beef lo mein was hilarious. Happily though, the movie never goes to slapstick comedy. (Just when you think there's gonna be the major barroom brawl, after Ford is kicked out of town, it's stopped before it goes anywhere). If I remember right Corbucci's "Vamos a Matar Companeros" sort of quotes that beginning sequence in The Sheepman, so now I think you should check Vamos a Matar Companeros out you will probably really like it, it is along the same lines and it has a catchy Morricone score. is that one a comedy too or is it serious? Its humorous like The Sheepman, not slapstick like My Name is Nobody.